This Groundhog is alert at Gunpowder State Park. 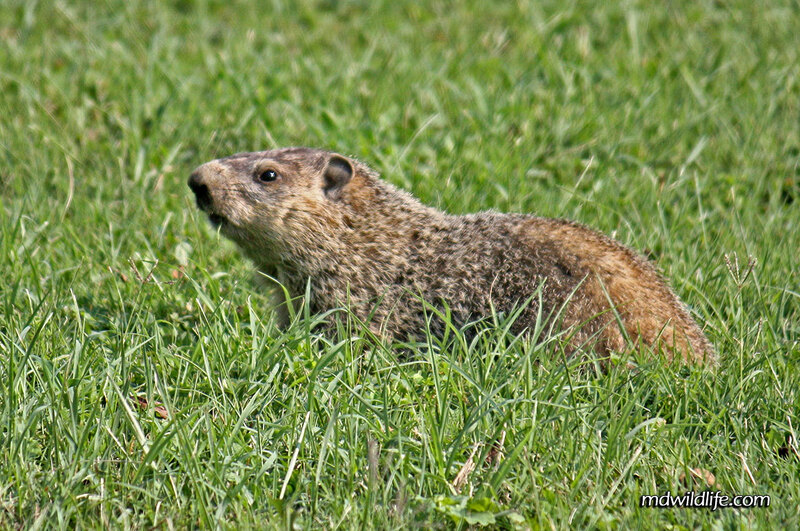 The Groundhog (Marmota monax) is a pretty popular and good sized rodent that you may come across in an open park, woods or even your backyard. They are fairly common in Maryland and the animal itself has a large distribution across North Amercia. I have seen groundhogs at Gunpowder State Park and Elk Forest, and in the backyards of some friends. I’m positive you would have a good chance in coming across one in several other areas. Much like the epic movie Caddyshack suggests, yes, you may see them on a golf course, as well. Groundhogs are not shy about establishing a habitat in close promiximty to people, because they use an underground system of tunnels and burrows, with multiple entrances and exits, and don’t need to spen too much time in plain sight. Usually staying low to the ground when on the move, Groundhogs pop their heads up occasionally when startled, as a sign of alertness. That alert position is usually your best oppotunity for a photo. We live in Pasadena, MD and our property backs up to woodland/wetlands. We have had a ground hog living in our neighbor’s yard or more recently in the edge of the woods for the past 3 years. Occasionally we spot him passing through our yard on his visit to who knows where. We look forward to his visits as he is very alert and entertaining. This is the first ground hog we’ve had in 30 years living here.